Authors: Yessong Johng, George Dolbier, Peter Bogdanovic, Dominique Cimafranca, Rufus Credle Jr.
Every construction project relies on a few critical components. When building a house, the critical components include the foundation, plumbing, and electrical wiring. When building a computing environment, the critical components include a robust operating system, file, and network services. 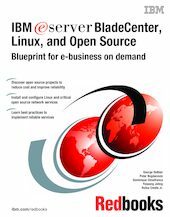 If you are looking to reduce the cost of your computing infrastructure, provide critical IT services, install Linux on BladeCenter blades, and install and configure SAN storage with Linux and BladeCenter, this book is for you.